New Holland has unveiled a methane-powered concept tractor that reduces overall emissions by 80 percent. Presented last week at the Farm Progress Show in the US state of Illinois, the methane-powered tractor concept reimagines tractor design and is a vital piece in the sustainable farming puzzle, New Holland says. "The new methane-powered concept tractor is the latest development in New Holland’s pursuit of sustainable and efficient technology through innovation," New Holland agriculture brand president Carlo Lambro says. "Its ground-breaking engine delivers the same performance and has the same durability as its standard equivalent, but with much lower running costs," Lambro adds. "It combines alternative fuels and advanced agricultural technology to create a vital link that closes the loop in the Energy Independent Farm’s virtuous cycle by running on the energy produced from the land and waste products." 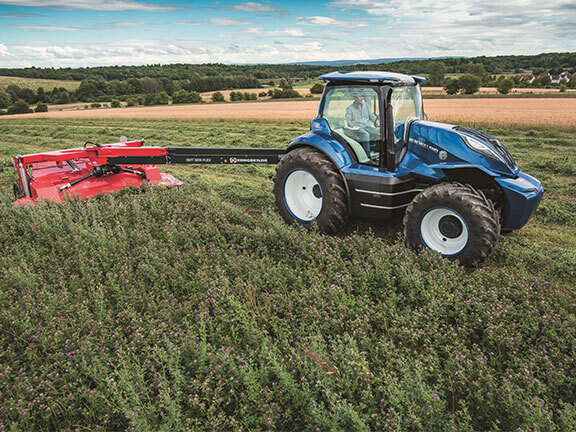 New Holland sees the farms of the future as being completely energy independent; farms that produce not only food, but also the biomass they need to generate the energy used to run their operations and power their machinery. This isn’t the first alternatively fuelled tractor from New Holland – the company was the first to offer 100-percent biodiesel compatibility in 2006. It also developed the world’s first hydrogen tractor concept, the NH2, in 2009. In 2012 New Holland created its first propane-fuelled tractor prototype and followed this up in 2013 with its first T6 methane-powered tractor prototype. The new methane-powered New Holland builds on the foundations laid by the previous T6 methane power prototypes, the company says, adding: "It features a powertrain that uses a ground-breaking efficient combustion technology specifically developed for agriculture applications by FPT Industrial." Under the bonnet of the new concept tractor is a six-cylinder NEF methane engine which delivers 180hp and 740Nm – the same power and torque specs as its standard diesel equivalent while generating up to 30-percent running cost savings, New Holland says. The company claims that, in real field conditions, the methane-powered concept tractor produces at least 10 percent lower CO2 emissions and reduces overall emissions by 80 percent compared to a standard diesel tractor. The obvious connection between methane and farming is a large factor for New Holland’s development of this technology. "Biomethane as a sustainable fuel is particularly well suited to farms, as they have the raw materials and the space to house a bio-digester to produce the gas," the company says. The bio-digester is fed with specifically grown energy crops, animal waste, food waste or crop residues. The biogas produced in the bio-digester is transferred to a refining station where it is transformed into fuel-grade methane to power the farm’s vehicles and machinery.